Teaching Alexander the Great gave Aristotle many opportunities and an abundance of supplies. He established a library in theLyceum which aided in the production of many of his hundreds of books. The fact that Aristotle was a pupil of Plato contributed to his former views of Platonism, but, following Plato’s death, Aristotle immersed himself in empirical studies and shifted from Platonism to empiricism. He believed all peoples’ concepts and all of their knowledge was ultimately based on perception. Aristotle’s views onnatural sciences represent the groundwork underlying many of his works. Aristotle’s views on physical science profoundly shaped medieval scholarship. Their influence extended into the Renaissance and were not replaced systematically until the Enlightenment and theories such as classical mechanics. Some of Aristotle’s zoological observations were not confirmed or refuted until the 19th century. [examples needed] His works contain the earliest known formal study of logic, which was incorporated in the late 19th century into modern formal logic. In metaphysics, Aristotelianism profoundly influenced Judeo-Islamic philosophical and theological thought during the Middle Agesand continues to influence Christian theology, especially the scholastic tradition of the Catholic Church. Aristotle was well known among medieval Muslim intellectuals and revered as “The First Teacher” (Arabic: المعلم الأول‎). His ethics, though always influential, gained renewed interest with the modern advent of virtue ethics. All aspects of Aristotle’s philosophy continue to be the object of active academic study today. Though Aristotle wrote many elegant treatises and dialogues –Cicero described his literary style as “a river of gold”– it is thought that only around a third of his original output has survived. Aristotle, whose name means “the best purpose”, was born in 384 BCE in Stagira, Chalcidice, about 55 km (34 miles) east of modern-day Thessaloniki. His fatherNicomachus was the personal physician to King Amyntas of Macedon. Although there is little information on Aristotle’s childhood, he probably spent some time within the Macedonian palace, making his first connections with the Macedonian monarchy. At about the age of eighteen, Aristotle moved to Athens to continue his education at Plato’s Academy. He remained there for nearly twenty years before leaving Athens in 348/47 BCE. The traditional story about his departure records that he was disappointed with the Academy’s direction after control passed to Plato’s nephew Speusippus, although it is possible that he feared anti-Macedonian sentiments and left before Plato had died. Aristotle and Plato’s compatibility has been a strongly debated topic. Recently, Harold Cherniss summarized Aristotle’s Platonism from the standpoint of classicist Werner Jaeger, stating that: “Jaeger, in whose eyes Plato’s philosophy was the “matter” out of which the newer and higher form of Aristotle’s thought proceeded by a gradual but steady and undeviating development (Aristotles, p. 11), pronounced the “old controversy”, whether or not Aristotle understood Plato, to be “absolut verstandnislos“. Yet this did not prevent Leisegang from reasserting that Aristotle’s own pattern of thinking was incompatible with a proper understanding of Plato.” Contrary to Leisegang’s sympathies, Jaeger was sympathetic to a compatible reading of Aristotle and Plato. Aristotle then accompanied Xenocrates to the court of his friend Hermias of Atarneus in Asia Minor. There, he traveled with Theophrastus to the island of Lesbos, where together they researched the botany and zoology of the island. Aristotle married Pythias, either Hermias’s adoptive daughter or niece. She bore him a daughter, whom they also named Pythias. Soon after Hermias’ death, Aristotle was invited by Philip II of Macedon to become the tutor to his son Alexander in 343 BCE. Aristotle was appointed as the head of the royal academy of Macedon. During that time he gave lessons not only to Alexander, but also to two other future kings: Ptolemy and Cassander. Aristotle encouraged Alexander toward eastern conquest and his attitude towardsPersia was unabashedly ethnocentric. In one famous example, he counsels Alexander to be “a leader to the Greeks and a despot to the barbarians, to look after the former as after friends and relatives, and to deal with the latter as with beasts or plants”. By 335 BCE, Artistotle had returned to Athens, establishing his own school there known as the Lyceum. Aristotle conducted courses at the school for the next twelve years. While in Athens, his wife Pythias died and Aristotle became involved with Herpyllis of Stagira, who bore him a son whom he named after his father, Nicomachus. According to the Suda, he also had an eromenos, Palaephatus of Abydus. This period in Athens, between 335 and 323 BCE, is when Aristotle is believed to have composed many of his works. He wrote many dialogues of which only fragments have survived. Those works that have survived are in treatise form and were not, for the most part, intended for widespread publication; they are generally thought to be lecture aids for his students. His most important treatises includePhysics, Metaphysics, Nicomachean Ethics, Politics, De Anima (On the Soul) and Poetics. Near the end of his life, Alexander and Aristotle became estranged over Alexander’s relationship with Persia and Persians. A widespread tradition in antiquity suspected Aristotle of playing a role in Alexander’s death, but there is little evidence. Following Alexander’s death, anti-Macedonian sentiment in Athens was rekindled. In 322 BCE, Eurymedon the Hierophant denounced Aristotle for not holding the gods in honor, prompting him to flee to his mother’s family estate in Chalcis, explaining: “I will not allow the Athenians to sin twice against philosophy” – a reference to Athens’s prior trial and execution of Socrates. He died in Euboea of natural causes later that same year, having named his student Antipater as his chief executor and leaving a will in which he asked to be buried next to his wife. Plato (left) and Aristotle (right), a detail of The School of Athens, a fresco by Raphael. Aristotle gestures to the earth, representing his belief in knowledge through empirical observation and experience, while holding a copy of his Nicomachean Ethics in his hand, whilst Plato gestures to the heavens, representing his belief in The Forms, while holding a copy ofTimaeus. In places, Aristotle goes too far in deriving ‘laws of the universe’ from simple observation and over-stretched reason. Today’s scientific method assumes that such thinking without sufficient facts is ineffective, and that discerning the validity of one’s hypothesis requires far more rigorous experimentation than that which Aristotle used to support his laws. He [Aristotle] refers to many examples of changes now constantly going on, and insists emphatically on the great results which they must produce in the lapse of ages. He instances particular cases of lakes that had dried up, and deserts that had at length become watered by rivers and fertilized. He points to the growth of the Nilotic delta since the time of Homer, to the shallowing of the Palus Maeotis within sixty years from his own time … He alludes … to the upheaving of one of the Eolian islands, previous to a volcanic eruption. The changes of the earth, he says, are so slow in comparison to the duration of our lives, that they are overlooked; and the migrations of people after great catastrophes, and their removal to other regions, cause the event to be forgotten. Each of the four earthly elements has its natural place. All that is earthly tends toward the center of the universe, i.e., the center of the Earth. Water tends toward a sphere surrounding the center. Air tends toward a sphere surrounding the water sphere. Fire tends toward the lunar sphere (in which the Moon orbits). When elements are moved out of their natural place, they naturally move back towards it. This is “natural motion”—motion requiring no extrinsic cause. So, for example, in water, earthy bodies sink while air bubbles rise up; in air, rain falls and flame rises. Outside all the other spheres, the heavenly, fifth element, manifested in the stars and planets, moves in the perfection of circles. Aristotle held more accurate theories on some optical concepts than other philosophers of his day. The second oldest written evidence of a camera obscura (after Mozi c. 400 BC) can be found in Aristotle’s documentation of such a device in 350 BC in Problemata. Aristotle’s apparatus contained a dark chamber that had a single small hole, oraperture, to allow for sunlight to enter. Aristotle used the device to make observations of the sun and noted that no matter what shape the hole was, the sun would still be correctly displayed as a round object. In modern cameras, this is analogous to the diaphragm. Aristotle also made the observation that when the distance between the aperture and the surface with the image increased, the image was magnified. According to Aristotle, spontaneity and chance are causes of some things, distinguishable from other types of cause. Chance as an incidental cause lies in the realm ofaccidental things. It is “from what is spontaneous” (but note that what is spontaneous does not come from chance). For a better understanding of Aristotle’s conception of “chance” it might be better to think of “coincidence”: Something takes place by chance if a person sets out with the intent of having one thing take place, but with the result of another thing (not intended) taking place. Aristotle examines the concepts of substance and essence (ousia) in his Metaphysics (Book VII), and he concludes that a particular substance is a combination of both matter and form. In book VIII, he distinguishes the matter of the substance as the substratum, or the stuff of which it is composed. For example, the matter of a house is the bricks, stones, timbers etc., or whatever constitutes the potentialhouse, while the form of the substance is the actual house, namely ‘covering for bodies and chattels’ or any other differentia (see alsopredicables) that let us define something as a house. The formula that gives the components is the account of the matter, and the formula that gives the differentia is the account of the form. Referring to potentiality, this is what a thing is capable of doing, or being acted upon, if the conditions are right and it is not prevented by something else. For example, the seed of a plant in the soil is potentially (dynamei) plant, and if is not prevented by something, it will become a plant. Potentially beings can either ‘act’ (poiein) or ‘be acted upon’ (paschein), which can be either innate or learned. For example, the eyes possess the potentiality of sight (innate – being acted upon), while the capability of playing the flute can be possessed by learning (exercise – acting). Aristotle’s predecessor, Plato, argued that all things have a universal form, which could be either a property, or a relation to other things. When we look at an apple, for example, we see an apple, and we can also analyze a form of an apple. In this distinction, there is a particular apple and a universal form of an apple. Moreover, we can place an apple next to a book, so that we can speak of both the book and apple as being next to each other. He gave accurate descriptions of ruminants‘ four-chambered fore-stomachs, and of the ovoviviparous embryological development of thehound shark Mustelus mustelus. Aristotle’s classification of living things contains some elements which still existed in the 19th century. What the modern zoologist would call vertebrates and invertebrates, Aristotle called ‘animals with blood’ and ‘animals without blood’ (he did not know that complex invertebrates do make use of hemoglobin, but of a different kind from vertebrates). Animals with blood were divided into live-bearing (humans and mammals), and egg-bearing (birds and fish). Invertebrates (‘animals without blood’) are insects, crustacea (divided into non-shelled – cephalopods – and shelled) and testacea (molluscs). In some respects, this incomplete classification is better than that ofLinnaeus, who crowded the invertebrata together into two groups, Insecta and Vermes (worms). For Charles Singer, “Nothing is more remarkable than [Aristotle’s] efforts to [exhibit] the relationships of living things as a scala naturae“ Aristotle’s History of Animals classified organisms in relation to a hierarchical “Ladder of Life” (scala naturae or Great Chain of Being), placing them according to complexity of structure and function so that higher organisms showed greater vitality and ability to move. In a similar fashion, Aristotle believed that creatures were arranged in a graded scale of perfection rising from plants on up to man, the scala naturae. His system had eleven grades, arranged according “to the degree to which they are infected with potentiality”, expressed in their form at birth. The highest animals laid warm and wet creatures alive, the lowest bore theirs cold, dry, and in thick eggs. Aristotle’s successor at the Lyceum, Theophrastus, wrote a series of books on botany—the History of Plants—which survived as the most important contribution of antiquity to botany, even into the Middle Ages. Many of Theophrastus’ names survive into modern times, such as carpos for fruit, and pericarpion for seed vessel. The first medical teacher at Alexandria, Herophilus of Chalcedon, corrected Aristotle, placing intelligence in the brain, and connected the nervous system to motion and sensation. Herophilus also distinguished between veins and arteries, noting that the latter pulsewhile the former do not. Though a few ancient atomists such as Lucretius challenged the teleological viewpoint of Aristotelian ideas about life, teleology (and after the rise of Christianity, natural theology) would remain central to biological thought essentially until the 18th and 19th centuries. Ernst Mayr claimed that there was “nothing of any real consequence in biology after Lucretius and Galen until the Renaissance.” Aristotle’s ideas of natural history and medicine survived, but they were generally taken unquestioningly. According to Aristotle, memory is the ability to hold a perceived experience in your mind and to have the ability to distinguish between the internal “appearance” and an occurrence in the past. In other words, a memory is a mental picture (phantasm) in which Aristotle defines in De Anima, as an appearance which is imprinted on the part of the body that forms a memory. Aristotle believed an “imprint” becomes impressed on a semi-fluid bodily organ that undergoes several changes in order to make a memory. A memory occurs when a stimuli is too complex that the nervous system (semi-fluid bodily organ) cannot receive all the impressions at once. These changes are the same as those involved in the operations of sensation, common sense, and thinking . The mental picture imprinted on the bodily organ is the final product of the entire process of sense perception. It does not matter if the experience was seen or heard, every experience ends up as a mental image in memory. Recollection is the self-directed activity of retrieving the information stored in a memory “imprint” after some time has passed. Retrieval of stored information is dependent on the scope of mnemonic capabilities of a being (human or animal) and the abilities the human or animal possesses . Only humans will remember “imprints” of intellectual activity, such as numbers and words. Animals that have perception of time will be able to retrieve memories of their past observations. Remembering involves only perception of the things remembered and of the time passed. Recollection of an “imprint” is when the present experiences a person remembers are similar with elements corresponding in character and arrangement of past sensory experiences. When an “imprint” is recalled, it may bring forth a large group of related “imprints”. Aristotle taught that virtue has to do with the proper function (ergon) of a thing. An eye is only a good eye in so much as it can see, because the proper function of an eye is sight. Aristotle reasoned that humans must have a function specific to humans, and that this function must be an activity of the psuchē (normally translated as soul) in accordance with reason (logos). Aristotle identified such an optimum activity of the soul as the aim of all human deliberate action, eudaimonia, generally translated as “happiness” or sometimes “well being”. To have the potential of ever being happy in this way necessarily requires a good character (ēthikē aretē), often translated as moral (or ethical) virtue (or excellence). In addition to his works on ethics, which address the individual, Aristotle addressed the city in his work titled Politics. Aristotle considered the city to be a natural community. Moreover, he considered the city to be prior in importance to the family which in turn is prior to the individual, “for the whole must of necessity be prior to the part”. He also famously stated that “man is by nature a political animal”. Aristotle conceived of politics as being like an organism rather than like a machine, and as a collection of parts none of which can exist without the others. Aristotle’s conception of the city is organic, and he is considered one of the first to conceive of the city in this manner. Aristotle considered epic poetry, tragedy, comedy, dithyrambic poetry and music to be imitative, each varying in imitation by medium, object, and manner. For example, music imitates with the media of rhythm and harmony, whereas dance imitates with rhythm alone, and poetry with language. The forms also differ in their object of imitation. Comedy, for instance, is a dramatic imitation of men worse than average; whereas tragedy imitates men slightly better than average. Lastly, the forms differ in their manner of imitation – through narrative or character, through change or no change, and through drama or no drama. Aristotle believed that imitation is natural to mankind and constitutes one of mankind’s advantages over animals. While it is believed that Aristotle’s Poetics comprised two books – one on comedy and one on tragedy – only the portion that focuses on tragedy has survived. Aristotle taught that tragedy is composed of six elements: plot-structure, character, style, thought, spectacle, and lyric poetry. The characters in a tragedy are merely a means of driving the story; and the plot, not the characters, is the chief focus of tragedy. Tragedy is the imitation of action arousing pity and fear, and is meant to effect the catharsis of those same emotions. Aristotle concludes Poetics with a discussion on which, if either, is superior: epic or tragic mimesis. He suggests that because tragedy possesses all the attributes of an epic, possibly possesses additional attributes such as spectacle and music, is more unified, and achieves the aim of its mimesis in shorter scope, it can be considered superior to epic. Aristotle was a keen systematic collector of riddles, folklore, and proverbs; he and his school had a special interest in the riddles of the Delphic Oracle and studied the fables ofAesop. Aristotle’s analysis of procreation describes an active, ensouling masculine element bringing life to an inert, passive female element. On this ground, feminist metaphysics have accused Aristotle of misogyny and sexism. However, Aristotle gave equal weight to women’s happiness as he did to men’s, and commented in his Rhetoric that a society cannot be happy unless women are happy too. Modern scholarship reveals that Aristotle’s “lost” works stray considerably in characterization from the surviving Aristotelian corpus. Whereas the lost works appear to have been originally written with an intent for subsequent publication, the surviving works do not appear to have been so. Rather the surviving works mostly resemble lecture notes unintended for publication. The authenticity of a portion of the surviving works as originally Aristotelian is also today held suspect, with some books duplicating or summarizing each other, the authorship of one book questioned and another book considered to be unlikely Aristotle’s at all. Some of the individual works within the corpus, including the Constitution of Athens, are regarded by most scholars as products of Aristotle’s “school,” perhaps compiled under his direction or supervision. Others, such as On Colors, may have been produced by Aristotle’s successors at the Lyceum, e.g., Theophrastus and Straton. Still others acquired Aristotle’s name through similarities in doctrine or content, such as the De Plantis, possibly by Nicolaus of Damascus. Other works in the corpus include medieval palmistries andastrological and magical texts whose connections to Aristotle are purely fanciful and self-promotional. Another common assumption is that none of the exoteric works is extant – that all of Aristotle’s extant writings are of the esoteric kind. Current knowledge of what exactly the exoteric writings were like is scant and dubious, though many of them may have been in dialogue form. (Fragments of some of Aristotle’s dialogues have survived.) Perhaps it is to these that Cicero refers when he characterized Aristotle’s writing style as “a river of gold”; it is hard for many modern readers to accept that one could seriously so admire the style of those works currently available to us. However, some modern scholars have warned that we cannot know for certain that Cicero’s praise was reserved specifically for the exoteric works; a few modern scholars have actually admired the concise writing style found in Aristotle’s extant works. One major question in the history of Aristotle’s works, then, is how were the exoteric writings all lost, and how did the ones we now possess come to us The story of the original manuscripts of the esoteric treatises is described by Strabo in his Geography and Plutarch in his Parallel Lives. The manuscripts were left from Aristotle to his successor Theophrastus, who in turn willed them to Neleus of Scepsis. Neleus supposedly took the writings from Athens to Scepsis, where his heirs let them languish in a cellar until the 1st century BC, when Apellicon of Teos discovered and purchased the manuscripts, bringing them back to Athens. According to the story, Apellicon tried to repair some of the damage that was done during the manuscripts’ stay in the basement, introducing a number of errors into the text. When Lucius Cornelius Sulla occupied Athens in 86 BC, he carried off the library of Apellicon to Rome, where they were first published in 60 BC by the grammarian Tyrannion of Amisus and then by the philosopher Andronicus of Rhodes. Greek Christian scribes played a crucial role in the preservation of Aristotle by copying all the extant Greek language manuscripts of the corpus. The first Greek Christians to comment extensively on Aristotle were John Philoponus, Elias, and David in the sixth century, and Stephen of Alexandria in the early seventh century. John Philoponus stands out for having attempted a fundamental critique of Aristotle’s views on the eternity of the world, movement, and other elements of Aristotelian thought. After a hiatus of several centuries, formal commentary by Eustratius and Michael of Ephesus reappears in the late eleventh and early twelfth centuries, apparently sponsored by Anna Comnena. 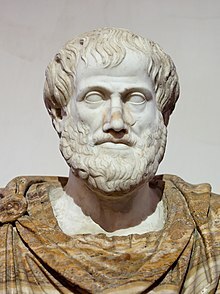 In accordance with the Greek theorists, the Muslims considered Aristotle to be a dogmatic philosopher, the author of a closed system, and believed that Aristotle shared withPlato essential tenets of thought. Some went so far as to credit Aristotle himself with neo-Platonic metaphysical ideas. With the loss of the study of ancient Greek in the early medieval Latin West, Aristotle was practically unknown there from c. CE 600 to c. 1100 except through the Latin translation of the Organon made by Boethius. In the twelfth and thirteenth centuries, interest in Aristotle revived and Latin Christians had translations made, both from Arabic translations, such as those by Gerard of Cremona, and from the original Greek, such as those by James of Venice and William of Moerbeke. The German philosopher Friedrich Nietzsche has been said to have taken nearly all of his political philosophy from Aristotle. However implausible this is, it is certainly the case that Aristotle’s rigid separation of action from production, and his justification of the subservience of slaves and others to the virtue – or arete – of a few justified the ideal of aristocracy. It is Martin Heidegger, not Nietzsche, who elaborated a new interpretation of Aristotle, intended to warrant his deconstruction of scholastic and philosophical tradition.Ayn Rand accredited Aristotle as “the greatest philosopher in history” and cited him as a major influence on her thinking. More recently, Alasdair MacIntyre has attempted to reform what he calls the Aristotelian tradition in a way that is anti-elitist and capable of disputing the claims of both liberals and Nietzscheans.